ATM Information-ATM is a name that has made its place in almost every life in today's world. Almost everyone uses it. Where we had to stand in the hour long to withdraw money from the bank, the same has come to the rescue of the ATM. Now whenever we want, from where we can easily withdraw money when needed. Now you have to buy any type of ATM easily. 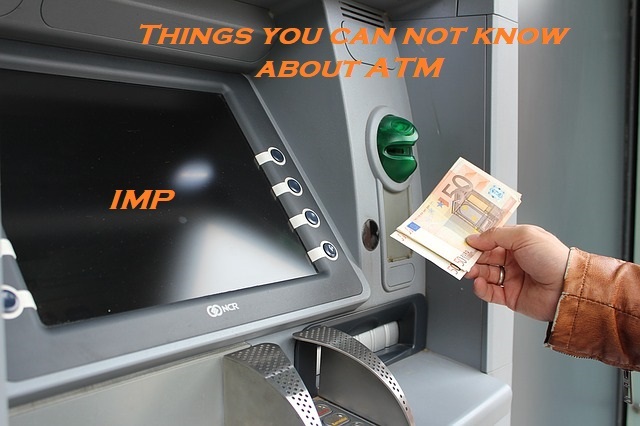 Almost everyone from you has used an ATM, but do you know some important information related to the ATM, such as what is the full form of ATM, or what is the history of ATM? - ATM Information In this post we are going to share similar important information related to the ATM with you. The full form of ATM is Automated Teller Machine. Confluence between people is often seen in the full form of ATM. Some people say ATM's full form is All Time Money, then some people say that its full form is Any Time Money. But the correct full form of the ATM is the Automated Teller Machine. The ATM was invented in 1960 by John Shepherd Baron. In the early stages, ATM was known as Bankograph. It is believed that the ATM was first used in the "Barclay Bank of Infield" located in London on June 27, 1967. If talk of India, then the facility of ATM started here since 1987. India's first ATM was installed in Hong Kong and Shanghai Banking Corporation (HSBC) of Mumbai. In the last decade and a half, the ATM has brought about a lot of change in people's lives. Where there was a need to stay in the lane for the first time to withdraw money from the bank, many formalities had to be followed, the same has come to the rescue of the ATM. With this help you can withdraw money in a few minutes. Also, ATMs are open 24 × 7 days, so you can withdraw money whenever you need. It does not have to wait for the bank to open. In today's time, the ATM is not limited to mere withdrawal of money, but its use has increased in many other areas. With the help of ATM, you can book online tickets. ATM can also be used in online shopping. Now the electricity bill is to be deposited online, or the phone bill is deposited, the ATM can be used everywhere. It is believed that the inventor Baron of ATM wanted to keep his pin 6 digits, but later his wife explained to him that people will have trouble in remembering the pin of 6 digits, so later Baron will pin it 4 digits Since then, this format of ATM Pin has been running so far. According to statistics, there are more than 30 lakh ATM machines worldwide, of which around 2.5 lakhs of machines are in India alone. Antarctica is a country where there is only 1 ATM machine. ATM, built for the Army on the border of India - China, is the world's highest ATM, with a height of 14,300 feet from sea level. Brazil is a country where biometric ATM is used, under which fingerprint is used instead of the pin to withdraw money from the ATM. It is safer than a pin. In addition to withdrawing money, there is also an ATM machine that extracts gold. The first gold-derived machine was installed in Abu Dhabi.